After I was done taking photos of my Lead Painters League Round Five entry, I figured the setup I use might be of interest to others. So here’s a photo of the highly sophisticated setup I used for this week’s Russian Civil War-based entry! Some leftover 3mm MDF balanced across a couple of junk chairs a roommate pulled out of the basement for some reason, on a porch that badly needs repainting! 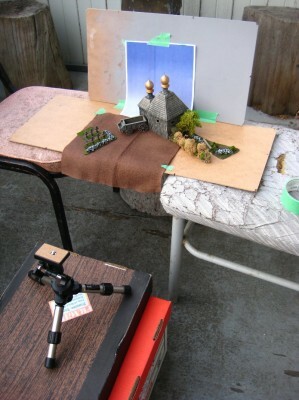 My little tabletop tripod at lower left is balanced on top of one of the banker’s boxes I used to store and transport scenery. The ground is a square of craft felt I sprayed with brown ink a few years ago; the colour backdrop is one of the ones I have available here on the Warbard for anyone to print. The building is of course my scratch-built Russian onion-domed church; the wagon, hedge and tree should all be familiar to regular readers. The Russian Orthodox cemetery is the most recent addition, with it’s laser-cut crosses. Lighting was provided by that convenient nearby fusion reaction (eight and a half light-minutes away is nearby by cosmic standards…) and agreeable meteorology. A home-made lightbox has been on my to-do list for… about a decade now. When the weather allows, an outdoor setup works nearly as well. There are a number of great photo-taking tutorials aimed at wargamers out there; check Google or YouTube for more details. One of these days I should do a links post to my favourites!